The Lam Watah Historic Trail is just east of the casinos of Stateline, NV. Although it’s more akin to a self-guided city park trail with its meticulous maintained trail and informative placards that discuss historic aspects of the area, it provides a welcome respite from the insanity of the casino corridor. Either hiked as an out-and-back trail (roughly 2 miles long) or a loop trail via the Nevada Beach Campground (roughly 3 miles long), the Lam Watah Historic Trail is perfect for young children and elderly adults as it’s flat and easy to navigate. One of the most appealing aspects of this trail is that it leads directly to Lake Tahoe at the south end of the Nevada Beach Campground (i.e. the dog friendly aspect of the beach). Click on the map to enlarge it for better viewing and printing. This map is only for reference and shows the Lam Watah Historic Trail as a loop through the Nevada Beach Campground. For a shorter out-and-back trip, simply hike directly to Lake Tahoe, then return via the same route. Always carry a traditional topographic map and compass when traveling in the backcountry. Parking is fairly limited (approximately 18 spots), but it’s free and vehicle turnover is relatively high since the Lam Watah Historic Trail is so short. The parking lot is located east of the Stateline casinos and Kingsbury Grade (SR 207) on the lake side of HWY 50, specifically on Kahle Drive (pronounced like the leafy green). One note about this parking area … it occasionally attracts homeless people and panhandlers due to its close proximity to the casinos. I’ve never experienced any problems other than being asked for a handout, but best not to leave anything visible or valuable in your vehicle. Realistically, this should be a standard practice for you when parking at any trailhead. The trailhead to the Lam Watah Historic Trail is located at the parking lot on Kahle Drive. Here’s a map to assist you in finding the parking lot and trailhead to the Lam Watah Historic Trail at Rabe Meadows. The Lam Watah Historic Trail isn’t hard-core by any means nor is it a secret Tahoe trail only known by a select few, but don’t let that discourage you from visiting Rabe Meadows. In addition to its free parking, flat terrain, short distance, and easy access to Lake Tahoe, the diverse area provides a habitat for a variety of birds. Also, this is a great place from which to watch the sunset. Just be sure you hustle back to your vehicle after the sunset because Rabe Meadows is day-use only (i.e. sunup to sundown). Again, the trailhead is at the parking lot. About .6 miles (soon after the large wooden bridge), you’ll reach a fork in the trail. Take the dirt trail on the left to hike directly to Lake Tahoe. The paved trail on the right is where you’ll return if you hike the Lam Watah Historic Trail in a loop. 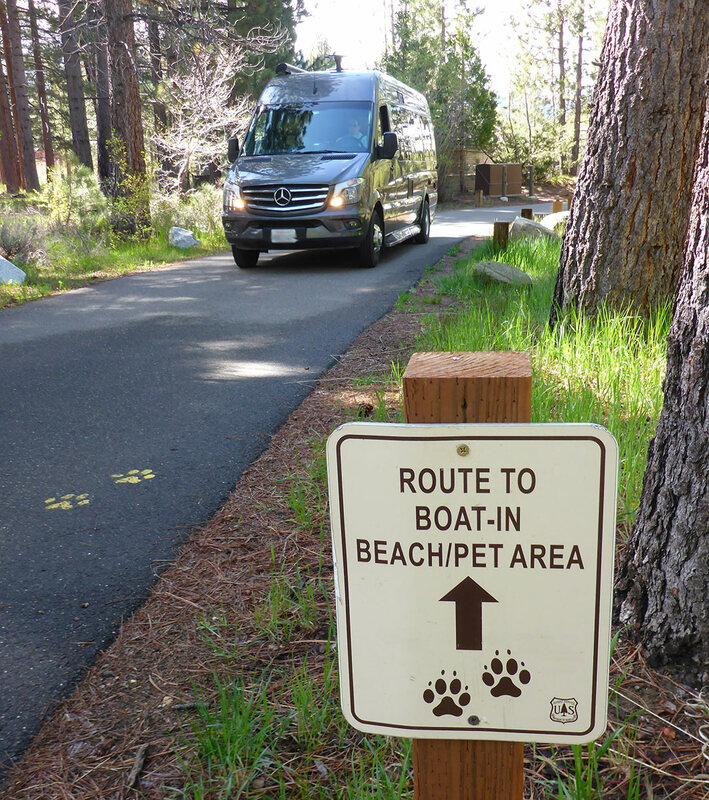 Traveling along the dirt trail, you’ll know you’ve reached the Nevada Beach Campground when you see dog-related signs posted near a paved roadway (lined with campsites). Look down at the road to find paw prints painted in yellow roughly every 20 feet. These prints will lead you to the south end of the campground’s beach where dogs are allowed to play. You don’t have to follow those paw prints. At this point, you can hike anyway you want through the campground (obviously not through someone’s campsite) to access Lake Tahoe. Just know that the route highlighted on the map I’ve provided above is based on following the yellow paw prints to the beach, and then to the entrance of the campground. No matter where you decide to walk, the shore of Lake Tahoe is essentially the turnaround point for an out-and-back hike along the Lam Watah Historic Trail. To log an extra mile (for a total of just over 3 miles) and make a loop of this trip, hike through the Nevada Beach Campground to its entrance. Then, walk along the paved path that runs alongside Elks Point Road. This trail travels in a clockwise direction and will eventually take you back to the fork in the trail that’s .60 miles from the parking lot. 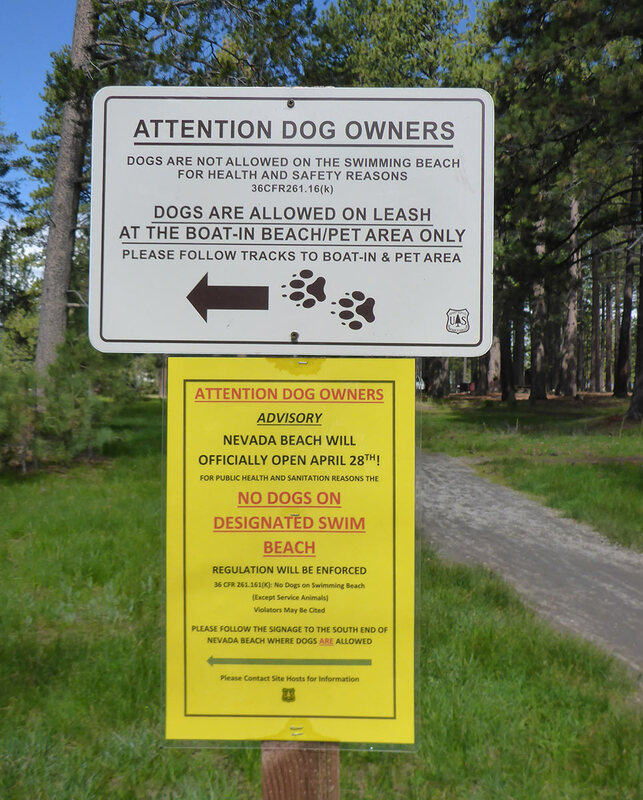 There are lots of people who hike their dogs on this trail as it is a dog-friendly trail, so definitely keep yours on a leash and pick up after them. The Lam Watah Historic Trail is a favorite of many locals who work in the immediate area because it provides them an opportunity to go for a scenic walk during their lunch breaks. 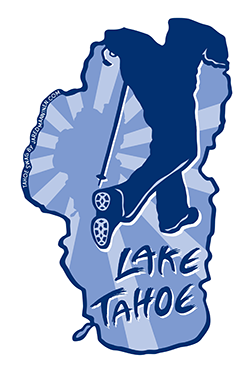 The trail is also good to access during low-snow winters because it’s located at lake level and on the eastern side of South Tahoe (i.e. it takes a long time for snow to accumulate at Rabe Meadows). Lastly, if you’re just looking to escape for an hour or two from your family or the business convention you’re attending, the Lam Watah Historic Trail makes for a relaxing and low commitment hike!